Stay tuned for 2019 News and Events! October 2016 - Meet Iggy Sorenseene, the park's new interpretive specialist! 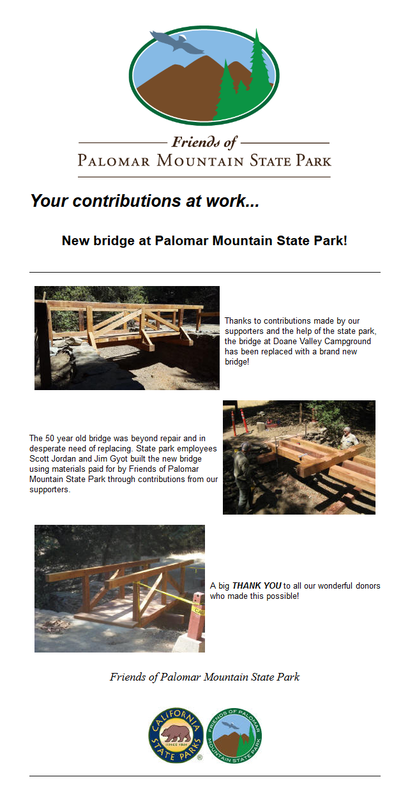 May 2015 - Friends of Palomar Mountain State Park now an independent 501(c)(3) non-profit and a California state park Cooperating Association. January 2015 - SDG&E grant allows 73 Escondido students to experience the park, many for the first time. January 2015 - Spotlight shines on Palomar in two media presentations. April 2014 - Palomar's park ranger receives State Parks' "Hill Award"
February 2014 - Palomar named by Sunset Magazine among 20 top "mountain escapes for high-altitude adventure" in western U.S.
March 2013 - Harrah's-Rincon employees volunteer their time and skills to install new doors in the Group CG restroom and shower building.